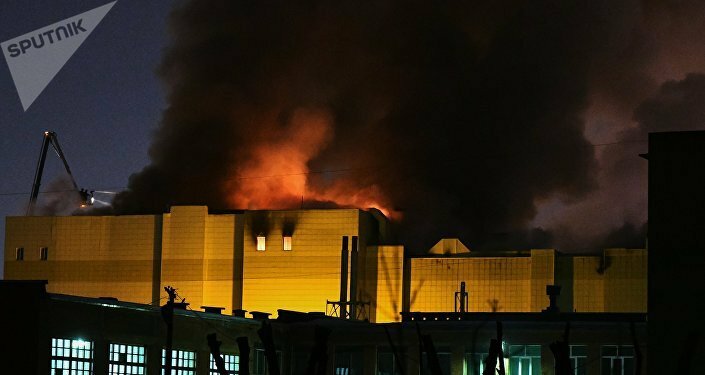 MOSCOW (Sputnik) - The major fire, which broke out in the Zimnyaya Vishnya ("Winter Cherry") shopping mall in Kemerovo on Sunday, has claimed lives of at least 64 people, mostly children, and left dozens injured. The first reports of the fire in a shopping mall emerged on Sunday afternoon. The blaze was supposed to have broken out on the shopping mall’s fourth floor, where a cinema and children's play area are located. Witnesses have insisted that fire alarms in the mall, which was completely packed at the weekend, failed to go off, causing people to panic and rush through narrow corridors, filled with black smoke. Some jumped out of windows to save their lives. The emergency services reportedly deployed some 15 fire teams, while the national center for crisis management announced that over 660 people were engaged in emergency response activities. The building’s structures soon started collapsing, so rescue teams and fire fighters were working in extremely difficult conditions. Russian Emergencies Minister Vladimir Puchkov and Health Minister Veronika Skvortsova immediately departed for Kemerovo to supervise emergency response activities. It took fire fighters almost 16 hours to extinguish the blaze. The death toll was growing at a terrifying speed while dozens of people, including children, were initially announced missing. According to the latest official estimates, 64 people have been killed in the fire. DNA testing has started to identify the victims. A total of 51 have sought medical treatment following the tragedy. 25 victims of a deadly fire, including 13 children, have been identified so far, according to Skvortsova. Russian Deputy Emergencies Minister Vladlen Aksyonov said that the works on the fire site are expected to be completed by the end of Tuesday. Meanwhile, the Russian Investigative Committee has opened several criminal cases into the incident, including into the deaths through negligence and fire safety violations. The official cause of the conflagration is yet to be determined, although reports suggest that it could have been started by a child misusing a cigarette lighter or malfunctioning electrical wires. According to the Investigative Committee, various violations were committed both during the shopping center’s entry in service and in the process of its work. Among them are blocked fire exits in the shopping center which prevented people from leaving the fire trap and a switched-off alarm system. Five suspects have been arrested over the case, including the head of the management company, servicing the shopping mall, and the head and an employee of the mall's private security company. The tragedy has already launched a series of checks into compliance with fire safety regulations across the country. The incident, which has cut short lives of so many people, including children, has deeply shocked the country and caused a huge international reaction, with world leaders conveying condolences to the families and friends of those who have died. Deep condolences were expressed by leaders or senior officials of Serbia, Germany, Japan, Italy, the European Union, Ukraine, the United Kingdom, the United States, the Commonwealth of Independence States (CIS) member countries and many others. Local authorities in Kemerovo region have declared a three-day mourning starting Tuesday for those killed in the fire.